Everyone will enjoy the ins and outs of lacing with these sturdy lacing panels. Contains five double-sided lacing panels, plus five thick, color-coordinated laces! Ages 3 and up. 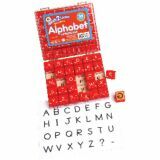 These sets of 1" uppercase and lowercase alphabets have easy-to-grip plastic handles and include 26 letters and 8 punctuation stamps, plus a clear, labeled and sectioned storage case. Set of 34. 140 pages. Learning success begins with fun activities and engaging characters. Explore following directions, sorting, comparing, sequencing, and patterning. 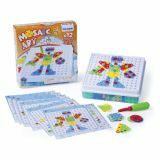 Content-rich Wipe-Off® Book offers children a friendly, comfortable way to experiment, wipe away, and try again. Every mastered skill builds confidence and sparks a joy for learning that lasts a lifetime. 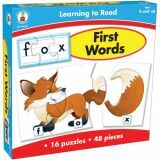 Great for use in classrooms, childcare centers, homes, and travel. 28-page book, 8 1/2" x 11". Coordinates with the Sea Buddies™ Collection. For best results, use with TREND Wipe-Off® Markers. Writes easy ... wipes clean. Perfect for all Wipe-Off® products and most reusable surfaces. Low-odor, nontoxic ink. Durable medium-point tip. 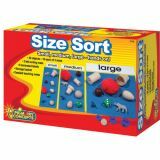 Great for counting to 100 by ones and tens, grouping, and one-to-one correspondence. 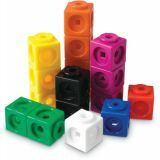 MathLink® Cubes feature geometric shape cutouts. 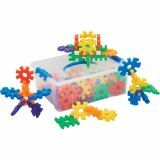 Cubes link together on all sides of each cube with geometric shape cutouts for more complex patterning activities. 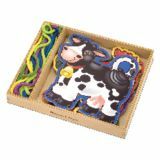 Playing with these large letter-shaped pegboards provides children with a fun way to learn letter recognition and improve hand-eye coordination. 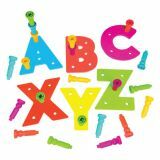 Set includes 26 large foam 3⁄8" thick letters with sizes ranging from 4" to 6 1/4" tall for easy handling, 130 Lauri Tall Stackers™ Pegs, and a storage box with handle. Ages 3 and up. Flashy by design! 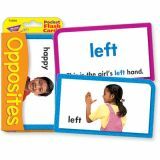 Build student confidence and skills using fun-filled flash cards. This pack, complete with activities, uses photos to teach opposites. The word and its use in a sentence on back. Watch students enjoy learning and build skills on their own or with friends… at school, home, or on the go! 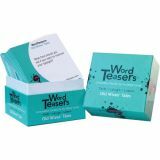 Durable, no-see-through cards with quick-sorting, rounded corners. 56 two-sided cards, 3⅛" x 5¼".